The "North Carolina Gold Trail" is a mural acknowledging our region's gold history. The mural project was created through a partnership between the McDowell Tourism Authority, the Arrowhead Artists and Artisans League, A3L, a local 501(c)(3) organization, and area artist, Linda Castren. The mural image shows two period gold miners, panning in a stream. 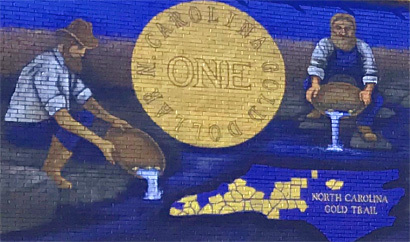 The gold coin in the mural represents the region's first gold mint, the Bechtler Mint, located in present day Rutherfordton, NC. Prior to the California Gold Rush, North Carolina provided the majority of the nation's gold. During the early to mid-1800s, in and around the Vein Mountain region of present day McDowell, Burke and Rutherford counties, approximately 5,000 people were employed by the gold industry. You can read and listen to additional details surrounding this period of McDowell County history, on our oral history site(link shown above). Historic Carson House, located at 1805 US Highway 70 in Marion, created an exhibit interpreting this period. Bechtler House and Museum is also a public museum, located at 130 West 6th Street in Rutherfordton, NC. Attend North Carolina's only "official" N.C. Gold Festival on the first Saturday in June, on the grounds of Old Fort's Mountain Gateway Museum. Find additional area mining attractions online at McDowell Tourism Authority site(link shown above). This is Old Fort's 10th mural! The 7 Wonders Trail and A Time To Build mural are also included on the Appalachian Mural Trail. The mural pieces are grouped close to one another, creating an easy walk through town. Begin your journey at our visitor center, located at 91 S. Catawba Avenue, Old Fort, NC. Linda Castren is a mural artist, living in Bat Cave, NC. She created the original mural design and is the sole mural artist. Linda has over 30 years of experience working on a wide variety of projects, using an equally large variety of mediums. While her current work focuses on public art, however, she has collaborated with and created art for music videos, commercials, and full length films including her work with Wes Craven and Michael Jackson. Closer to home, she contributed to public art projects such as the Tryon Horses (Art of the Horse) and Black Mountain Rocking chairs. Both public art projects raise awareness and funds for their respective communities.